Do your kids stress and frustrate you? Do they make you angry? If they don’t you are a saint, very rich or a liar. You can read a bit more about taking your feeling temperature on this Wiki How to Take a Feeling Temperature. I started this wiki. 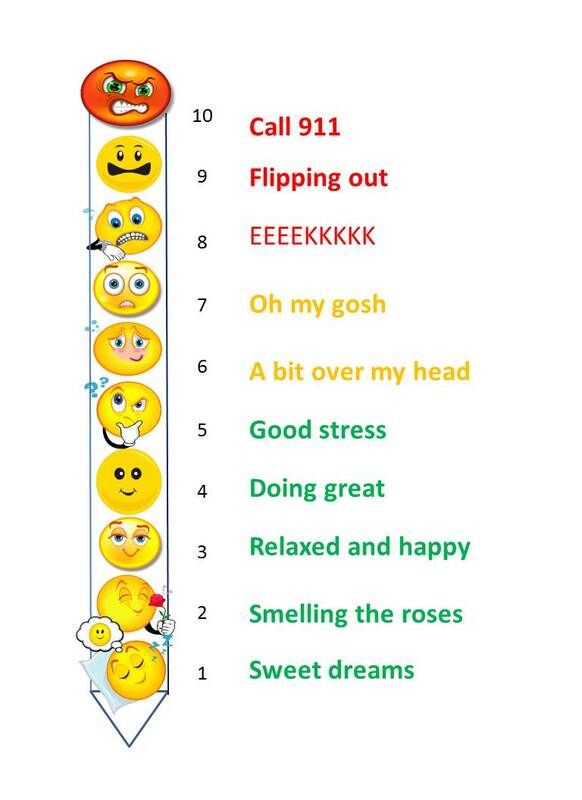 Keep track of the growth of negative feelings and how they grow is a major Emotional Fitness Skill. If your kids don’t make you say Eeeekkkke or Oh My Gosh at least a few times each day, I suspect someone else is primarily responsible for their care. I remarked recently on my twitter account that I was getting a bit sick of celebrity Moms and their happy, parenting is a joy faces. Suspect I am not alone. When a celebrity mom or dad get angry at their blessed events, they can call in lots of troops for support. Even then some go astray, think Britney and thank goodness Lohan hasn’t had a baby yet. But these are sad women who have major emotional problems. Parenting is frustrating work and frustration leads to anger. The behaviorists describe anger as “The interruption of a response sequence.” Every time you are interrupted, the stage is set for frustration and anger. If your kids are like most kids and you spend hours a day as their primary caretaker, you get interrupted lots. I marvel that so few parents blow it. Particularly in a society like ours that pushes venting anger. The popular psycho-babble and the media both promote venting. Much less useful than most people think. Here’s a E-book comic book that says “Never punish when angry. ” The book was written mainly for parents likely to abuse.” The advice is good for those with major problems controlling their tempers, but guilt inducing for those who feel normal anger and handle it reasonably well. There are times to vent anger, times to detach from it. Here are two stories about expressing anger. One of my sons as a two year and a half year old had difficulty falling asleep. Usually a story followed by a parent’s presence in the room chased away the monsters fairly quickly. One night nothing seemed to work and it had been a long hard stressful day. My patience broke. I left and expected cries to erupt, but intead total silence descended. I peeked back in after waiting ten minutes and my son was sound asleep. Aha, I thought if he thinks I’m angry, I can leave the room. I soon discovered anger would only work if I was really angry. Pretend anger did not calm his fears. My foster children taught me this did not apply just to little kids. I am not generally too upset by cursing. Words are words, I don’t curse if it would offend someone, but often see a well placed curse as a safe way to let go of some anger. My foster children, however, seemed to use cursing as a gate way to behaving badly and very quickly as foster parents we made our house a “No Bad Language” home. That cut down on fights and destroying property. At first I couldn’t really get angry and the kids didn’t think I meant cursing was forbidden. They would argue. In time I took major offense and then the kids cleaned up their language except when their anger needed a response from me. Then a curse word would do and they would accept the punishment–going to your room until you could apologize and be civil and a loss of some allowance. Otherwise, she suggests counting to 10. How does this apply to parents? In a number of ways. Even dogs know that a growl from a bigger dog means danger. A bit of anger on the part of a parent gets a child’s attention, says you are crossing a boundary, and take care. As with the two situations described above, my anger communicated that I meant business. It also met Tavris three of the four rules. A few foster children had to retaliate, but most did not. I tried always to err on the side of hope. Now there are times when you go a bit to far as a parent. A child steps on your last nerve and you growl louder than usual or even cross the line and might even spank. Kids can survive such parental failures as long as it does not reach the level of abuse (causing marks and bruises, applied without marks and bruises but is the main way of maintaining control–that is emotional abuse). C = Care enough to confront unacceptable behavior. That can mean letting someone know they have step on your last nerve and made you angry enough to yell. A = Ally with the child as soon as you are calm enough to remember who is the adult in the situation. You might have to go to Time Out to calm down. That is okay. But in time you need to be with and not against the child. If you are in the wrong, you must admit it and apologize. You are in the wrong if the child did not break a major rule, but your nerves were too frayed to deal with anything by A plus behavior on the child’s part. If the child did wrong, but you lost your cool, you still need to chill out and let the child know you blew it a bit but also deal unemotionally with his breaking a rule. R = Review by asking the child what they did to bring about the punishment or your blowing your cool. If the child did no wrong, then you must confess your sin and accept the standard house punishment. If the child broke a major rule, both you and the child should be clear on what the offending behavior was . As rules and punishments should be spelled out and written down, both should also know what the punishment will be. If you did wrong, thank the child for hearing you out. Beg his or her pardon and give a big “Thank You” when you are forgiven. Sounds hard, yes. As I have noted often parenting is hard and as Aristotle remarked managing anger properly is not easy. Be kind to me, like this post or share it. You will be helping me stay strong and maybe help some others as well. Click here for my free Ebook: The 12 Daily Emotional Fitness Training Exercises. They strengthen everyone. This entry was posted in Parenting Issues and tagged Emotional fitness, Katherine Gordy Levine, Managing anger. Carol Travis, Parenting advice, postaday, Practiicing kindness, Thinking about what matters, What is a parent to do., Wikihow. Bookmark the permalink.